Lawrence Dallaglio OBE is an England and Wasps Rugby Legend. 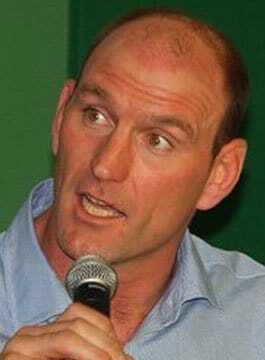 Dallaglio was born in Shepherd’s Bush, London in 1972. He was educated at Ampleforth College and was first spotted by Wasps while playing for the college at the Rosslyn Park 7’s in 1989. Lawrence Dallaglio became Wasps captain in the 1995 when he was also voted the RFU’s Player of the Year. Lawrence was a member of the triumphant England 7’s team which won the World Cup at Murrayfield in 1993 and has also played for his country at every representative level – Colts, Under 21, Student, ‘A’ team and 1st XV. Regarded as one of the world’s greatest ever back row forwards, Lawrence Dallaglio was the only player to play in every minute of every match during England’s successful campaign in Australia when they were crowned World Champions in 2003. This achievement made Lawrence the only northern hemisphere player to hold a world cup winners medal in both the 7s and 15 man game. Lawrence’s achievements with Wasps are also exceptional having won a hat-trick of Premiership titles from 2002 to 2005, a Tetley’s Cup win in 2000 and two famous European Cup victories in 2004 and 2007. His 18 year career with the club came to a fairy tale end in May 2008 when Wasps claimed the Premiership title beating Leicester Tigers in his last ever game. As well as being a Wasps, England and British & Irish Lions hero, he is an icon and figurehead of world rugby. As a keynote speaker, Lawrence’s presentation is based around Motivation and Inspiration, the Importance of Teamwork, Leadership and the Commitment to Success and Winning. He relates his experiences to the audience and the world of business.